Apichatpong Weerasethakul’s films are often described as dreamlike, but in Cemetery of Splendor, he stays outside of his dream world, turning his camera on characters lost in their own nocturnal adventures. The recurring image in the Thai master’s seventh feature is of a group of soldiers stricken with sleeping sickness in a hospital ward beneath translucent tubes whose shifting color values represent their respective subconscious palettes. As the shades tend to change in unison, we can infer that the men are dreaming together. Or, in other words: they’re all watching the same late-night movie feature—a metaphor made explicit in a hilarious scene in which the trailer for a Thai B-movie plays to a group of appreciatively mesmerized patrons. The director, though, is wide awake: in its linkage of drowsiness to governmental repression, Cemetery of Splendor reveals itself as an urgently political work underneath its characteristically languorous pacing. That many of Apichatpong’s fans have characterized it (charitably) as “more of the same” from a director whose ability to wring intriguing variations on themes borders on the supernal suggests that even some cinephiles wise to Apichatpong’s greatness are watching with eyes wide shut. Reverse Shot: A critic from Thailand described Cemetery of Splendor as a very direct movie in terms of its political meaning. I think for a lot of people who aren’t aware of the political situation, it will seem indirect. However, is it your strategy to address real issues in an indirect way? 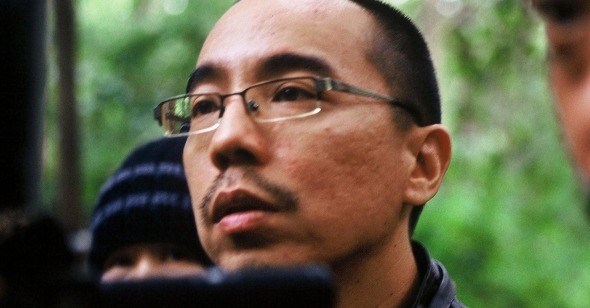 Apichatpong Weerasethakul: It’s hard to be direct. For me, when things are direct, they make me start to think of other forms of media, like literature, or a scholarly paper. For me, film is different. It’s something that stirs curiosity or emotions, and it’s only later that you discover what was underneath—or maybe not! There are many different levels. RS: I felt like this whole movie was about levels; the buried kings and their war; the hospital above them; the world of spirits hovering in the air. It’s a movie where there are always two levels—past and present, reality and fantasy. AW: Or more. I didn’t think about that all that much, consciously. There is an underground element of course, and the line between fantasy and reality. It’s all very spontaneous when we’re making the film and editing it, though. RS: In your films, it seems, reality and fantasy often coexist. Your characters don’t get to choose, and so neither does the audience. AW: It’s an expansion and reflection of the culture. In Thailand, there is a perception that is spiritual as well as physical. When you see a tree, it’s not only a tree, but there is something in it, there is something invisible there too. It has a force. It can seem nonsensical, and it can be hard to live because of these unknown beings, these different codes you have to understand. It can be frustrating! It has an influence on daily life, and it can also blend into daily life, and into politics too. So it’s very beautiful, it’s very exotic, but it can be too much. RS: The difference, I thought, in Cemetery of Splendor was that for once we never see these spiritual visions, like the tiger in Tropical Malady (2004) or the monkey ghost in Uncle Boonmee (2010). You kept them invisible. AW: It’s about suggestion. It’s challenging and interesting to try and use the power of suggestion through cinema, and to reflect what’s going on [in Thailand]. It’s almost like being hypnotized to believe something. That’s the whole purpose of movies. When I did research on sleeping, I read about all the cycles, and the whole repetition sleep cycles is ninety minutes long. So I thought that maybe the length of films evolved out of the length of dreams. RS: The scene in the movie theater, with the screen hanging over the audience as they watch, seems to mirror the men sleeping and dreaming in the hospital. It’s as if the movie is the audience’s dream. AW: I love that kind of movie theatre. I love the décor. It’s a very local theater in my hometown. The decoration and lighting is the way it was back when it was showing RoboCop (1987). RS: I thought of Goodbye, Dragon Inn (2003), except that in Tsai’s film the theater is empty. Here, there is a healthy audience. Is the idea that this kind of movie that we are seeing— this overwrought, melodramatic popular entertainment—is what finds an audience in Thailand today? AW: The movie I picked is actually quite uncommon. Now there are a lot of very slick Thai productions. This is unique. I found it on YouTube. The director is of an older generation, he’s 70 years old. In the end, the movie has not been released, because he can’t find a distributor. It’s such an old-fashioned kind of film. Like from thirty years ago. RS: I couldn’t help but thinking that it was a bit like your movies, even if it’s got a much more B-movie-ish style: your movies also have ghosts, romance, eroticism, magic . . . it’s the same thing, expressed differently. AW: Spiritually, [they are] the same! I grew up loving these kinds of movies before the VHS era, before we all saw American B-movies. It’s at the root. So I think it’s a tribute. I’m conscious that it’s funny, but it’s also sad in a way. RS: Why is it sad? AW: Because these movies no longer exist. RS: Your own films exist in the world in a unique way: you must be the most famous Thai filmmaker in history, or at least in a long time. I don’t know if they are really representative of Thai film culture, however. What is the filmmaking situation in the country overall? AW: We are declining. It’s like many places. We are a small country. We cannot keep up with Hollywood, of course. The economy and politics make it difficult to speak about certain topics. It’s very sensitive now, with the army in charge. The movies are mainly comedies or love films. Very self-obsessed. RS: Is there nothing hidden in these popular films? Is there any sense of subversion and critique within mass entertainments? AW: A few, yes, but those movies are not really popular. Popular films are self-censoring. It’s automatic. AW: I’m not representing anything nationally. It’s just my view. For Thai people . . . there are a lot of people who are happy with the situation now. RS: Are they like the soldiers in your movie? Are they sleeping? AW: Or I am sleeping. It can be confusing. RS: Why are the spirits in your films always introduced so casually? Nobody ever seems surprised to see them. AW: That’s life as I see it. We cannot be formal. On the street, it’s impossible to be organized. There are food carts everywhere. There are no straight paths for people. In my hometown, it’s always messy. That’s true on a larger scale of how the country is run. Anything goes. If there is a banana tree that suddenly has a different shape on it, people will come from many cities to this tree to pray. It’s very common for things like that to happen. RS: How does that tradition of belief connect to authoritarian politics? Do you think that the people who seize power in Thailand are true believers, or are they cynical? AW: There is a strong belief in the law of karma. You’re just part of this cosmic situation. You just accept it, and you’re happy that the country is seemingly peaceful at the moment. AW: For a lot of people, there is anger brewing up inside because of an inability to express things. RS: Does your celebrity, or your success, mean that it’s easier for you to express things? Has it gotten easier now that you’re an internationally recognized filmmaker? AW: No. I feel very trapped. There are many things I’d like to say. In the beginning, I had a more seamless interaction with the movies I’ve made. In Thailand, political awareness and political awakening is difficult to express. It feels more separate from what I’m doing. I feel like maybe I should stop. Maybe I should make something somewhere else. Not move somewhere else, but go somewhere else for these other interests. RS: In a way, you’re already a transnational filmmaker. There are so many logos of global funding bodies on Cemetery of Splendor. AW: It’s a simple movie, with very long credits. A lot of people, contributing not a lot of money. This international circle . . . I think I might have waited too long. There are things I’m interested in when I travel, and I feel like I should maybe open myself up to them more. RS: If you came to America to make a movie, what would it be? Would it be like RoboCop? AW: Maybe. But not in the same way. Europe and America are not really inspiring to me. The logic and scale of the productions feels very different to me. I feel intrigued by South America, for example, because I can still relate to it. I’m very curious about the practice of shamanism or healing. There’s a link there for me, or a thread. RS: I know that you’re a fan of Lucrecia Martel. What do you like about her films? RS: Do you enjoy being at film festivals, like this one? Do you get to see movies when you’re traveling? AW: There is never time to see movies. A festival like Toronto, there’s always work. There’s so much to do. At Cannes, I only saw Carol. I don’t really see movies, to be honest. I prefer to read or to stay home. And at home, it’s automatic that I can’t see these kinds of movies anyway, or I don’t want to have to watch them on my computer, on a small screen. RS: I loved the dinosaurs in Cemetery of Splendor. Where did those models come from? AW: My hometown, it’s the rage. There is an archaeology site not for from the town, and so the dinosaurs have been adopted as a kind of symbol. They’re everywhere! RS: I thought that they seemed like another reminder of those levels, what’s above ground and what’s below, and also past and present. They’re always just visible at the edge of the frame, watching the characters. AW: Thanks for noticing it. RS: I feel like you’re always interested in nonhuman, or not quite human, creatures and figures. And yet, as in Uncle Boonmee, there is a human star here, Jenjira. How much is her character here based on her real life? AW: Maybe eighty percent. Except that she’s not nationalist, not conservative. She’s married to an American, but the husband in the film is an actor. RS: So did the script develop out of conversations with her? AW: We’ve worked together a lot. I’m a very forgetful person, and she remembers everything. RS: Are you comfortable directing actors? AW: Only with Jen, or someone close to me. It’s not only about me. Directing is not a one-way thing. I need the right actors. If it’s someone from television in Thailand, I’m unable to direct them. Directing isn’t about changing what people do, and I respect what they do even if it’s different. RS: What about the camera? Do you think you’re more comfortable now in terms of setting up and getting shots? Has your style changed over the years? AW: I still feel very trapped by the frame of cinema. I rely a lot on my DP. We shot at least two angles on everything. I used to only shoot one. Yet I feel less confident than before. Not in a bad way. Before I was really conscious about framing. Now maybe I’m more relaxed. I try more things. But we have only two lenses, so there are still rules. RS: Whenever I interview a director who has a “long-take” aesthetic, I ask how much of that has to do with a way of seeing, and how much is practical. What would you do if you suddenly had a gigantic budget? AW: I think it would depend on the movie. If I had [a bigger budget], I would exploit it.